Why Are Reading Slumps a Thing? Hey Cats, how're we all this evening? I'm currently curled up in bed suffering from the worst illness ever. I'm sniffling sweaty mess, gross? I know. This week I have been suffering a lot from homesickness and this illness on top of that is unfortunately not helping the situation. Being home just under 2 weeks ago was lovely and it really showed me how much I appreciate my mum and my boyfriend. They are my rocks and being so far away from them at uni is starting to really take its toll on me, I miss them a hell of a lot. However, I'm trying to pick myself up by keeping myself busy and it is helping. For now though, here's today's post. Today I wanted to discuss reading slumps and how they've been the bane of my life recently. Due to university maddness I have definitely neglected reading, I just haven't made the effort to make time for it as I have been so preoccupied with university activities. I've also been in the WORST reading slump, I've had to put 2 books down as I just haven't had the motivation or want to read them. I always despise myself when I find myself in a reading slump as I question if it's my fault or if I'm just not into the book I'm currently reading... Does anyone else get into these dilemmas? Please tell me I'm not the only one! Recently I've been able to shake off the reading slump ('touch wood' I don't want to jinx myself!). I have also told myself that it's not my fault that I'm not in the mood to read, it's okay to not want to read. The book that has got me out of my reading slump is 'City of Glass' by Cassandra Clare. This book is so much better than the first two, I'll be honest but I wasn't overly struck with the first too and was skeptical when starting the third but oh my, I am LOVING this book. So much drama and tension and I love it. I'm also taking part in The Girl Gang Book Club this month and I feel really motivated to finish the book so I can take part in the reading discussion next Tuesday! I definitely recommend taking part in a book club if you're ever in a reading slump as it's so nice to have the discussion at the end. Overall I hate reading slumps and I'm super glad I've finally pulled myself out of one. Do you have any suggestions for me in the future if I find myself in another one? 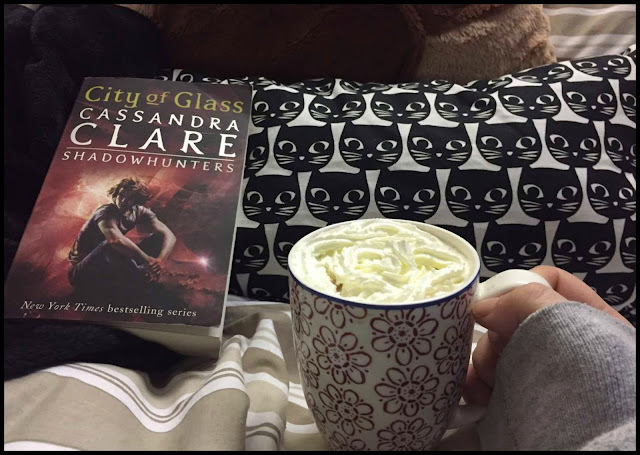 Also have you read City of Glass? I'm definitely in a reading slump at the moment, I can't just never find the time to read, it always seems to be last on my priority list. I think I might give a book club a go, maybe The Girl Gang one. I can imagine that it does give you a lot more motivation to read! I hate reading slumps! I used to be able to read an average of 5-6 books A WEEK up till I was about 14, but now I struggle to read one a month. I feel like because of my busy schedule, when I get time to myself books are never first on my to-do list. I really want that to change, but just don't have the motivation! Here's to my four year reading slump- if you can even call it that haha.